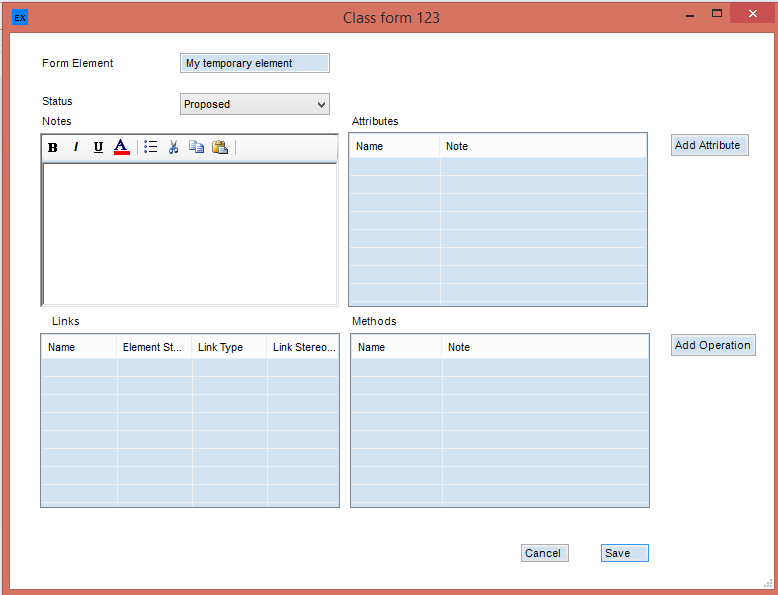 eaForms – using the eaForms action buttons !! A couple of weeks ago I outlined my view on the usefulness of lists when editing EA elements. In that post I illustrated the ability to add buttons to an eaForm which could be used to initiate some action such as adding a property. By providing buttons that initiate action we provide a means to perform the task with minimal context switch and hence minimal effort. our Add Attribute button will present an attribute form within the context of our already open form – no switching just a single button push. 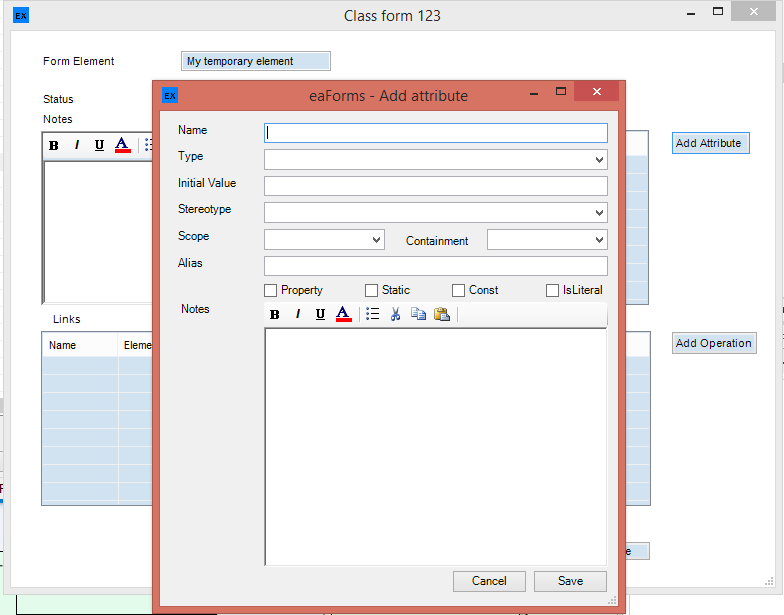 We also have a Detail button that can be added to the form and will save updates to the current element then open the element using the standard EA properties editor; a button we feel is useful for the experienced EA user who may at some time wish to switch for an instant. In my experience in addition to editing element properties the other may task is to add stuff – notes or new elements related to my current element, so we have added buttons that assist with this task. The example below illustrates a add a linked element button – which when pressed presents the user with a dialogue to enter basic information about the element and its relationship to the current element. Button options include both linking and / or owning the element. Also, although not a button, within eaForms we offer the related element control which allows the designer to specify a desired connection between the element that the user is editing and another element (optionally with a specific stereotype) and with a specified connector type. 1. Save and run script after save – which will save updates to the element and then execute a predefined script, performing some post saving action. For example, we could add an entry to a file to indicate that an element has been approved or some other project relevant event. 2. Run script and conditionally save the element or remain in edit – this button runs a script and depending on the outcome will either save any element updates or stay in editing mode, without saving any updates, and so presents the user with making any relevant modifications or preventing them saving updates that do not confirm to some project specific standards. By proving the option to perform pre-saving checks we can help ensure the integrity of the project. The second issue is the operation of the script – in our early release we have limited the scripts to VBScript and further do not support INC’s – and hope that is not too restrictive. We have found that most of what we would see as needed is readily available within the existing windows environment e.g. the use of the File System Objects. We will review this in due course. Finally, are there other script buttons that would help. Do we want to include a “Run Script” button that performs a task without doing any pre-defined action? In this post I have outlined the use of buttons within eaForms – from the simple add properties to the more powerful buttons with scripts that provide the user with the flexibility to do their own thing. As always hope this is of interested and welcome your questions and feedback. This entry was posted in Automation, Manager, Scripting on 30/03/2015 by exploringea. 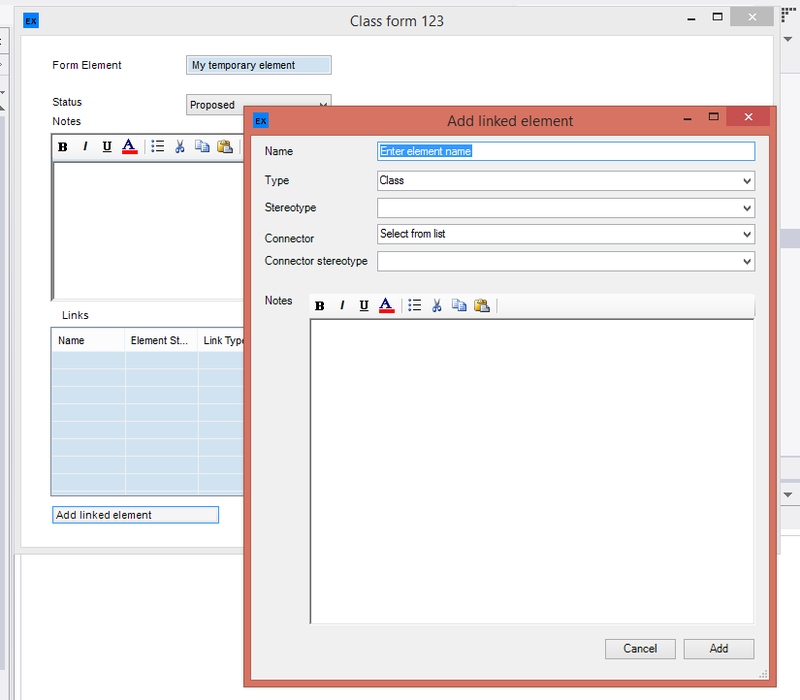 Scripting follow up on case #6 – prevent execution of script on AddCode – solved?? I had also observed a few cases myself but it appeared inconsistent. Now I’ve come back to look at the problem, by just looking at the code with fresh eyes the solution was obvious, wasn’t it? If I step back to the early 1970’s using basic interpreters, I entered the subroutines/functions then added a line to specify what routine to call. At which point the code would run. So if we look at the code example we see the subroutine plus a line “main” which I can only imagine is saying run “main”. 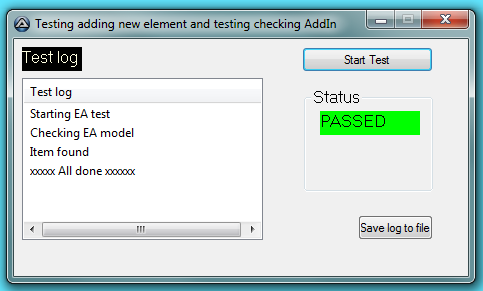 A quick check with my EA Script Tester AddIn, and yes this appears to solve the issue. I removed the last line i.e. “main” and the AddCode just adds the code without running, and the run does as we expect. And to check, putting “main” at the end and the script runs immediately on adding the code as well as when requested to run. BTW: I’m not sure that is what was referred to as the solution, which referenced needing to strip out the calls; however I felt it was worth checking out so I understand the rules. So if I create a new script, as below, which has several subroutines I performed a few tests. Running the code as illustrated it ran twice. I then removed the last line (“main”) and it only runs with the .run method is set. Worth noting that you can specify any subroutine name and it will run accordingly. But don’t forget that if the subroutine has parameters you need to configure and set the parameters object as the second argument of the run call as well as set up any dependent objects. I added calls to the subroutines between them and yes it does execute on loading . In testing it looks like all the code is loaded and then executed. Finally, I added one or more of the subroutine names at the end of the script and as I would expect it would run them in the defined sequence. In practice, when running EA scripts either in an AddIn or external program, to ensure the code isn’t executed when added we need to strip out any lines containing a reference to a subroutine in our script that are NOT contained within a function or subroutine otherwise they will instruct the script control to execute upon adding code. This was included in the initial post and although it may be a challenge not sure there is anything else – it’s the way the “interpreter” works and I guess for backwards compatibility will always work. Of course, we could want this behaviour – in fact I can see a case where some subroutines run to initialise “stuff” before a call is made to a specified subroutine – up to the designer/user. Having looked at a lot of documents on scripting in windows during my recent experiments I can’t recall any reference to the behaviour outlined above, although there are references to a distinct lack of documentation about the script control in general and perhaps this is the real issue!! I hope this is useful, and if there are other “script funnies” I’d be interested to here. PS: This was the issue highlight in my test Case #6 if you are interested. This entry was posted in Automation, Scripting on 12/03/2015 by exploringea. Calling a running AddIn from a script was has been a really interesting issue – read the original post for the background to this use case – and with some useful observations from my associated post on the Sparx Forum. I have explored further, and not quiet managed a workaround, and as outlined in this post do not expect a viable practical solution, but in the spirit of sharing my findings and coming to this conclusion, here is an outline of my experiments. 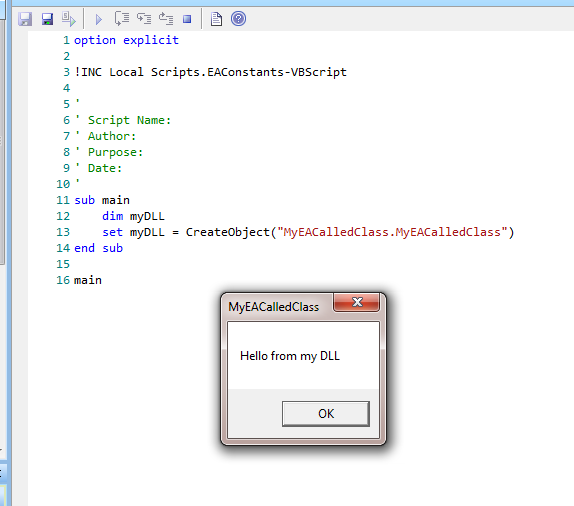 To help work discover what goes on with an EA AddIn, I produced a small AddIn(DLL) – called DLLTester. It’s main purpose was to be a very simple, normal EA AddIn with the added benefit that I could use it capture relevant system information that could help in investigating “the issue”. Thanks to Geert who pointed out what appeared to be a very simple solution. Based on windows documentation and various posts it looked like our AddIn DLL code would only be loaded a single time by the EA, process and if subsequent instances were required, they would share the same code. This would mean that static data would be shared across the different instances. So if during the initial load we store a reference to our AddIn as a static variable, it could be retrieved by all subsequent instances as required. In my initial test, I run EA and my AddIn loaded (the initialisation worked fine). I then create a new object in the script (see code below). And based on the premise that there is only a single copy of the DLL loaded, I would expect the code to be the same as the already loaded AddIn DLL, and hence the static data would already be initialised, and readily available as a reference to the required DLL. However this was not to be – I found that the static variable retrieved by my script was not set, and hence the was not the same code. Upon further inspection, using Process Explorer (see from the screen shot below), I found that EA and its Scripter engine exist in different processes (see PID) and hence their DLL’s are clearly different. The fact that they are different processes not only prevents an elegant solution but dare I say a practical safe solution at all, unless we start looking at using interprocess communication(?). Now even with my early background in writing operating system software (RSX, VMS – I am that old!) and that one of the key people behind both those operating systems and windows (Dave Cutler) which could suggest a common approach to the windows internals, I still wasn’t encourage to explore, perhaps another time. So I think I’ll have to park the idea that we can implement case #7 “call an Addin from a script” for the moment. However, before finishing, and purely out of interest I was keen to have a quick look at what I may be able to find. So here are a few things I did. Looking for more information about the EA copy of the DLL. To start with we need to know who we are, by which I mean what process are we. Using some code I found stackoverflow (see below) I was able to get the process ID of the script control. Basically, the method used creates a child process, we then inspect its parent id which is us, the script control. Using the process ID of EA we can get information about the EA process and specifically look for modules it has loaded; this should include our target AddIn DLL. This is where life started to get a little more difficult, in that I was unable to work out how to do this using VBScript, so I had to resort to some real coding to access the required system information. For simplicity of testing, I added the code to my DLLTester using functions that would return details for loaded modules as needed. Below is a snippet from one test function. Using the the process id (pid) of EA as the input it iterates through the modules, finding our target (“DLLTester”) and the outputs the required information. But after an hour or so I had more information but nothing that provided me with a usable object. So I have to acknowledge that my lack of detailed knowledge of the windows internals probably means I won’t solve this and so for the time being I will gracefully going to step back from this challenge. However, if anybody does have a practical solution I’d be really interested but somehow I don’t expect one to exist (there’s a challenge!). If you want to use get the list of DLL from the modules in a process there was a change at .Net 4 which means that managed DLL’s are no longer included in the list of modules – see stackoverflow for more information. System internals – I’ve used these a lot over the years. In this experiment I used – Process Explorer – worth checking through, as are the other tools as there are a range of utilities that may be useful at some time. Well I know this is not really about EA but more about windows programming, but then I’ve found that more than half the issues with producing an EA AddIn is about windows! This entry was posted in Scripting on 10/03/2015 by exploringea. I promised it wouldn’t be too long before I returned to provide the results from my experiments into running EA scripts from an external application (or if you wish from an EA Add-In). If you missed the previous post on scripting may be worth reading first so that the current post is read in context. Moving forward within exploring scripting capabilities let me start by providing some background information I discovered that will be relevant to the task in hand with the focus on user scripts. You will see below I have skipped stuff that I didn’t see necessary for the current experiments. When we want to run an EA script we need to know where they can be found. If you look into the EA database, and my suggestion would be to open a local EAP file using Access, you can find a table called t_script as illustrated below. ScriptAuthor – another GUID looking number – not sure where this points to yet. I’ll have to add this in when I find it but didn’t seem important at the time. 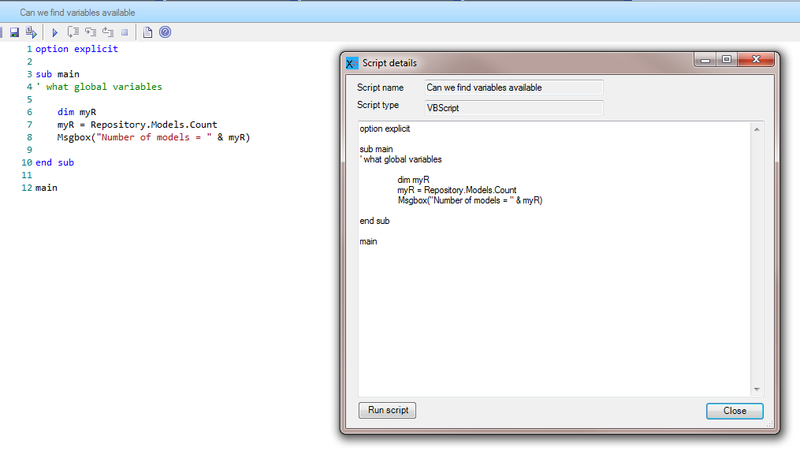 Script – contains the script code in plain text form for user scripts. When necessary I’ll have to check out the use of this for other types of scripts. 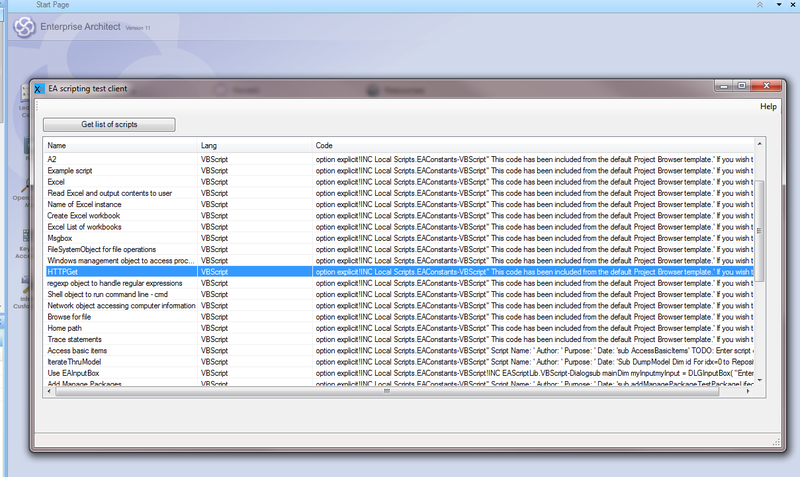 INCLUDES – If you look at scripts in EA you will see that some will include other scripts (e.g. INC). If we are running scripts within EA this is not a problem provided they exist within the EA context, however as we will see below, if we are running them elsewhere we need to ensure that we include ALL the relevant code. If you are executing your scripts in another environment then you will need to supply the relevant references if required; note that the session object is purely for use within the EA script running environment. With that bit of background we are now ready to look at running an EA script under the control of our “external” application. Why is this an issue? Can we not just ask EA to run the script for us? Well so far I cannot see a way to interact with the EA script engine via the automation interface. Hence, the solution I have used (and I believe used by many others) is to provide my own instance of the script engine, extract the relevant script code and execute. This isn’t as difficult as it sounds, although my voyage of discovery was interesting – and as seen from various posts on the Sparx Forum and Stack Overflow shared! As far as I can determine EA uses the Microsoft windows scripting engine. 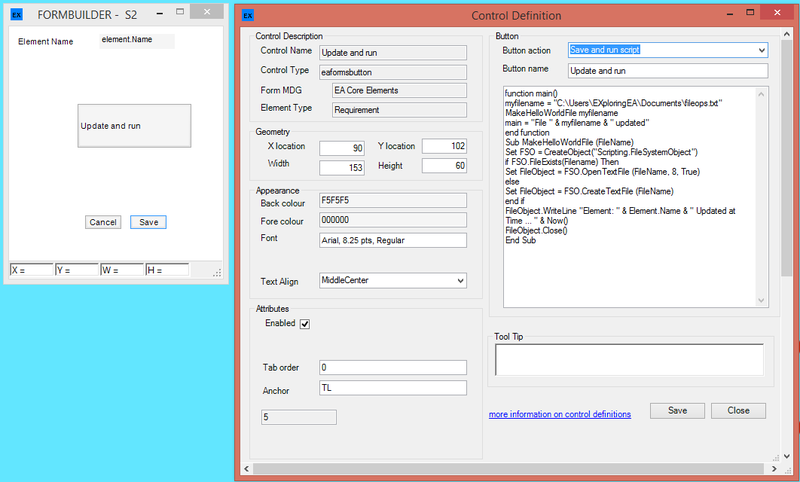 Which I believe is MSScriptControl – which means that VB Script and JScript scripts written for EA can be run by using this control. So with that background I put together a simple program to run a script. The application provided a means to enter a script and run it. This allowed me to verify that the mechanism worked fine without any interactions with EA. However, I need to remember to do things link reset the scriptcontrol if I reuse it (myScriptControl.reset)! It is also worth noting that I recently saw that there are some observed issues, for example – adding code will automatically execute code – I have only seen this issue when executing the script control within an EA Addin, it seemed to work fine when operating in a standalone program but that doesn’t mean there aren’t instances where this is not the case (the joys of software), hence I need to explore further! As it turned out I skipped writing a simple windows application as I was confident that would work, so went straight to writing a small Add-In that would perform these tasks. So no need to open the repository just the steps that followed. 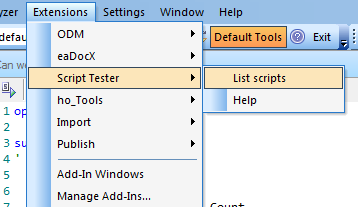 My simple Add-In basically lists the available user scripts and provides a means to inspect and run the script. The form that presents me with a list of scripts (as well as providing a option to refresh the list) is illustrated below. And if they wish run the script, for example as below. I am pleased to say that it presented the same result as when running the script natively within EA. So using this approach there is a a means to run EA scripts under our control, demonstrated with this EA Add-In, and I’m confident it will work from the outside with a windows application, albeit with care regarding the objects that are being expected. If I refer back to my diagram in the last post (repeated here for reference), that illustrated all the tests I wanted to explore. We have covered all cases 1 to 6 – albeit that there is ongoing work in checking some potential issues with case 6. So what about the EA script control (not our own script control) calling an EA Add In. Just to be clear this is a normal EA script running within EA. Is there a way? Well I’m still working on this. I’ve posted and had some interesting observations which I have posted on the Sparx Forum. This case has presented some interesting windows programming issue which has forced me to spend more time that planned looking into windows processes, but then that is the fun of exploring. I hope to report back soon with my findings for these cases. In the meantime, if you have some answers do join the dialogue here or on the forums. For those happy with other scenarios I hope you have found this useful. This entry was posted in All, Scripting and tagged Scripting on 24/02/2015 by exploringea. In my last post on scripting I was looking at using scripts as part of customising EA. When I finished the last post I was part way through my exploration of “Application Interoperability”. So let me continue, but I must warn you that in this post I won’t be covering too much that is unique to scripting, however it is nevertheless useful stuff that provides some groundwork for subsequent experiments into scripting. Last time I looked at how a script can gain access to an application such as Excel which can operate as a COM server. 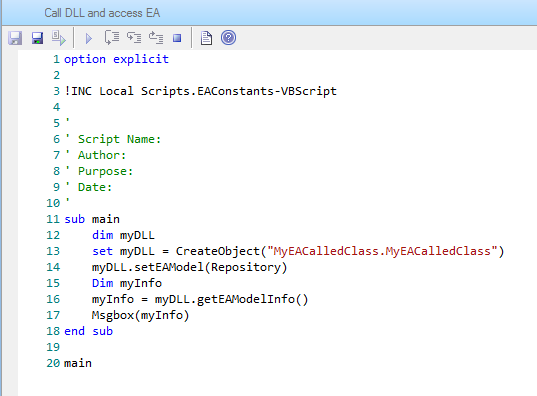 My next set of experiments looked into if and how scripts could interact with code that I’d developed outside of EA, for example, a windows application or from one of my own class libraries (DLL). To provide a sense of what I was thinking about let me use a diagram to illustrate theses and other options I am exploring. In the diagram I show EA and its repository together with several other components that may be treated within the current context as being “internal” to EA’s operating environment plus several components that clearly site “outside of the box”. I have treated everything that EA knows about including any registered AddIns as being inside, the others, which EA doesn’t know about, are outside. To guide us through the experiments I have numbered the connections to represent each specific test; remember we are in the world of experimenting, so I am just illustrating capability, whether or not it is of any value is another story. our library needs to be registered as a COM object so that Windows is aware of the class when our script wants to use it. So here is the code for my class library – very simple. This class is compiled as a library and then registered for COM interop using regasm, this is the same way that we register an EA AddIn – see my post One of our Addins is missing for more information. 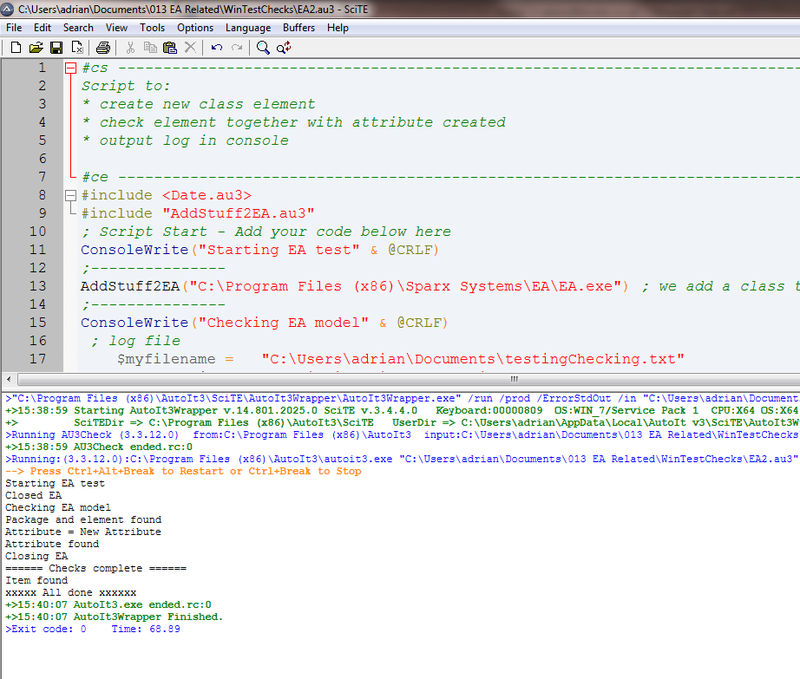 And then within our EA model we can create a script that calls this class as illustrated in the screen shot. 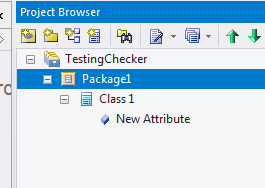 When the script runs we get the message box that we have in the class constructor. So we have address case 1 – now into case 2. Below is a trivial example. The setEAModel receives the current EA repository object which is stored locally and then the getEAModelInfo method interacts with EA and returns a value to the calling process, in our case as shown below a simple script. Here is an example script calling our class library and getting information back relating to the current repository. Clearly we wouldn’t create a library to perform such a trivial task which can be done locally. However, there may be situations where you want other functions such as interacting with another application / service that cannot be done within a script, but doesn’t warrant the need to create an EA addin, and hence this could be an option. 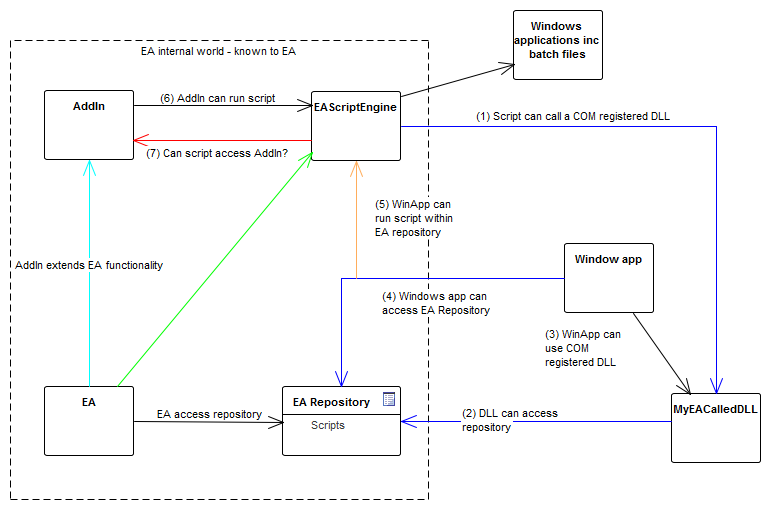 The next 2 examples look at using a windows application as a EA client, firstly just accessing the EA repository and then accessing and running a script. The first test case (3) of access our own DLL is purely windows and an everyday task for windows application developers, so no more on that. Perform required functions as required. to run automatically to perform some house keeping tasks on the repository – this allows the application to be scheduled with windows Task Scheduler. BTW: In relation to working with EA I have found it really useful at time to produce a small windows application accessing EA as an external application. I have developed a small template application which provides the basic infrastructure for interacting with EA, selecting and opening a repository and providing basic element functions that I continually reuse when testing stuff. For the final experiment today, I was looking at a means for an external windows application to make a call to EA, and for EA to run a requested script for us. 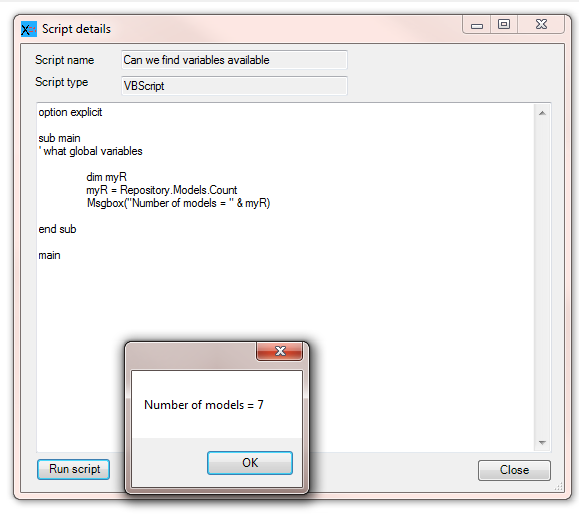 For example, there can be scenarios when you want to run a script on an automatic basis. As far as I can see EA doesn’t provide a means to open EA from a command line, run a script and close. The nearest I can see is the Project Shortcut – which nearly fulfils the requirements except that it doesn’t appear to provide a means to run a suitable script of my choice. Is there a mechanism? Well in the meantime it looks like I will have to create an application that will open my repository and execute the scripts. So how can this be done – well as I started I see it’s not a short answer so I’m going to dedicate my next post to that task, as well as look at possible interactions between EA Addins and EA scripts. I’m already writing it so won’t be long. In the meantime I hope this was of interest. Any queries about this or other scripting issues let me know as I could add them to my expanding list of scripting experiments. This entry was posted in API, Automation, Manager, Scripting on 16/02/2015 by exploringea.